This TOP 10 shows that the palmar dermatoglyphics play a key rol in recognizing Down syndrome (see hand signs II, III, V, VI & IX); 4 of these signs relate to the palmar hypothenar zone [in the field of palmistry a.k.a. the 'mount of Moon']. NOTICE: Log Odds Ratios are calculated from the prevalence (%) among Down syndrome patients & controls. • Hand signs in DOWN SYNDROME! • Hand signs in FRAGILE-X SYNDROME! • Hand signs in DIABETES MELLITUS! • Hand signs in RHEUMATOID ARTHRITIS! • Hand signs in PSORIASIS! • Hand signs in SCHIZOPHRENIA! • Hand constellations in Agreeableness! • Hand constellations in Conscientiousness! • Hand constellations in Extraversion! • Hand constellations in Neuroticism! • Hand constellations in Openness! Not all 32 hand signs listed in this article represent equal significance for recognizing the hand in Down syndrome. Only in 14 of these hand signs is the prevalance at least about 10x higher than in the general population. One of these hand signs concerns the simian line (hand sign 9-1), which explains why it is often associated with Down syndrome and it's presence inside the TOP 10 hand signs for Down syndrome (see above). Next to the simian line there are 13 other hand signs which are about 10x more frequently observed in Down syndrome (compared to the general population): 2-1, 2-2, 5-1, 5-3, 8-2, 8-4, 8-10, 8-11, 8-12, 8-13, 8-14, 8-15 and 9-4. In 1963 L.S. Penrose presented the first 'phantom picture' (featured with the simian line) describing the typical hand characteristics in Down syndrome. More detailed 'phantom pictures' were presented by Schaumann & Alter (1976), Rodewald (1981). 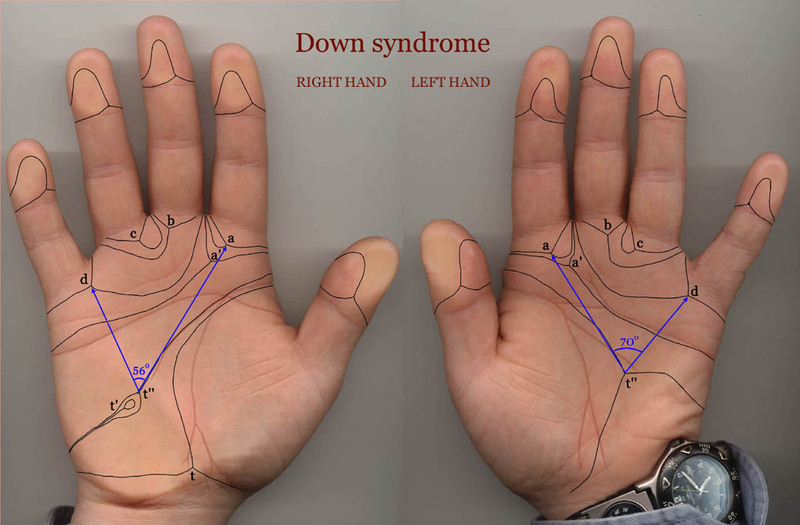 This illustrates how the simian line sort of has the status to represent one of the many skin features that is significant for Down syndrome; however, it does not belong to the TOP 5 most significant hand signs for recognizing Down syndrome. And statistics indicate that genetic testing of people who have a simian line in both hands usually only in about 1% the outcome will show the outcome of Down syndrome (versus a chance of about 0.1% in people who do not have simian line). So, about 99% of simian line people around the world do not have Down syndrome and therefore one should be aware that simian lines can also be observed in about 3% of the healthy population. Also, the simian line is also known to bare significance in quite some other (medical) populations. Actually, there is another hand sign which has higher significance on the same level [lines = level 10]: a single interphalangeal crease on the pinky finger (hand sign 9-1) - however this concerns a hand sign which is more rare in Down syndrome (+ never seen in the general population), which probably explains why that other hand-line sign is far less often mentioned even though it is much more significant for Down syndrome than the simian line is! By the way, just like the other features this single interphalangeal crease on the pinky finger is not unique for Down syndrome because it is sometimes also spotted in other genetic disorders (especially other trisomies). Down syndrome represents the most common cause of intellectual disability, caused by a trisomy on the 21th chromosome (trisomy 21). According Multi-Perspective Palm Reading Down syndrome is described to become manifest in at least 4 out of the 5 major perspectives of the hand (key-words for the 5 major perspectives are: function, proportion, skin, palm & fingers; the role of the function perspective is least obvious in Down syndrome). This article presents an overview of 32 individual hand signs significant for Down syndrome. 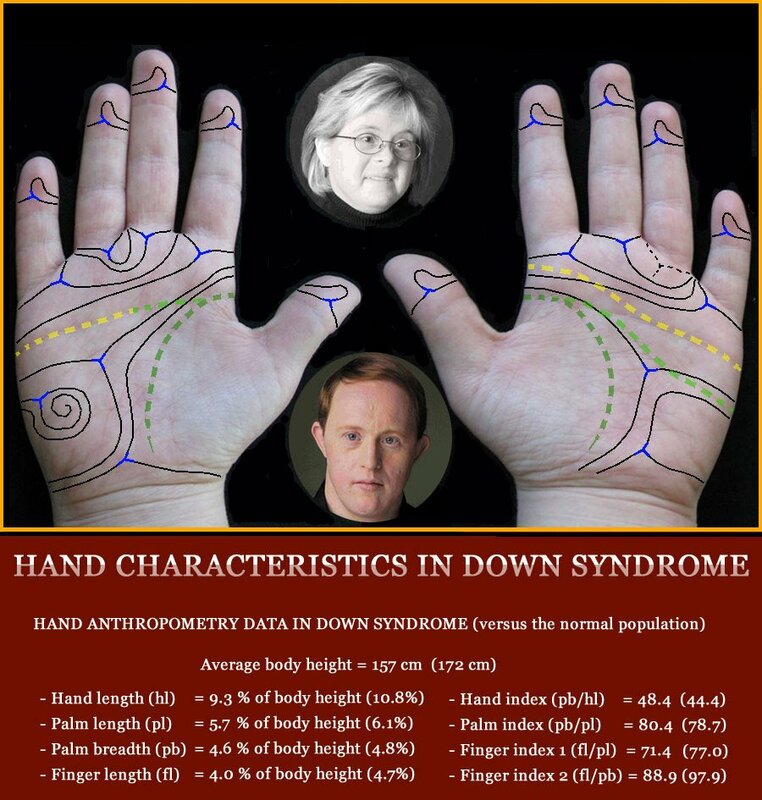 The hand sign statistics reported in this article indicate that Down syndrome always manifests at the skin-related level of the dermatoglyphics, combined with abnormalities in typically all levels that relate to proportion (including: hand shape, palm shape & finger shapes). The hand zones that typically get involved are: the pinky finger & the palmar hypothenar. • How to make an assessment for the hand in Down syndrome? • TOP 10 hand signs Down syndrome: 10 most significant hand signs! • Down syndrome & the simian line: the essentials! Key-elements of the hand in Down's syndrome in a nutshell: palm & fingers display typical dermatoglyphics (usually featured with: high positioned axial triradius on hypothenar with ulnar loop, horizontal alignment of main lines; ulnar loop fingerprints, possibly with a radial loop on pinky or ring finger); small hands with squarish palm shape + short fingers with small, short fingernails; pinky finger is likely so display one or more abnormalities (e.g. clinodactyly, single interphalangeal crease); unusual major palmar creases (often featured with simian crease or Sydney line). -D.S. REQUIREMENT no.1: The person requires to have significant hand signs for Down syndrome in 4 of the 5 major perspectives of the hand, including: proportion, skin, palm & fingers. - D.S. REQUIREMENT no.2: The person requires to have at least 5 of the 15 hand signs that relate to the dermatoglyphics [= level 8]. - D.S. REQUIREMENT no.3: The person requires to have at least 1 of the 7 possible hand signs that relate directly to the pinky finger. - D.S. REQUIREMENT no.4: The person requires to have at least 8 out of the 32 listed hand signs. IMPORTANT: Only when all above REQUIREMENTS are fullfilled, then one can speak safely of 'confirmed' hand diagnosis for Down's syndrome! Some of the 32 significant hand markers for Down syndrome that are listed below became known in medical science as a 'physical minor anomaly' (such as: the simian crease, Sydney line & single interphalangeal crease on pinky regarding the lines/flexion creas, and clinodactyly & brachydactyly regarding the fingers/digits). But in general all these individual hand markers can usually be described to represent harmless body characteristics. And even when 'constellations' of two or more of these hand signs are observed at one level of the hand, these hand markers should not be recognized as suspicious - unless each of both hands display such constellations in at least 2 or more perspectives of the hand. 4-1 - Short palm length vs. palm width (squarish shaped: ratio > 85 %). 5-4 - Incurved pinky finger [clinodactyly]. 7-2 - Very small fingernails [micronychia]. 8-15 - Dysplasia: palmar ridge dissociation [broken skin ridges]. 8C-1 - Pattern on thenar [mount of venus]. 9-4 - 5th finger interphalangeal creases: single crease. The major perspectives 'PALM' & 'FINGERS' can be derived seperately from the first three perspectives (= function, proportion & skin). NOTICE: About 0.1% of the world population has Down syndrome. But in Down syndrome the occurence of diabetes type 1 is much higher (estimates indicate almost 4x times), therefore it is interesting to notice that 8 of the 33 hand signs in Diabetes Mellitus are also listed as significant hand signs in Down syndrome! The 'phantom picture' for Down syndrome presented above displays only 27 of the 32 hand signs; more details about the prevalence of all 32 hand signs in Down syndrome populations AND the general population are presented below (outside the box). NOTICE: Hyperextensible finger joints are associated with a muscle condition named 'muscular hypotonia'. NOTICE: It is important to notice that palm shape is an age dependent characteristic (children have more square-shaped palms than adults). In Down syndrome the handpalm is usually small, and especially short (compared to body length); but the width of the palm is relatively large. NOTICE: It is important to notice that relative finger length is an age dependent characteristic (children have relatively shorter fingers than adults). In Down syndrome the fingers are usually short, frequently 'abnormally short' (according the Mehes scales 'abnormally short fingers' are defined as: middle finger length is shorter than 40% of full hand length; full length hand is measured from the tip of the middle finger to the distal flexor crease of the wrist). NOTICE: In Down syndrome the short, low set thumb is also featured with minor motoric hand gesture & closure inabilities. NOTICE: In Down syndrome the length of the pinky finger is sometimes shorter than half of the palm length. NOTICE: In Down syndrome the (short) incurved pinkie is quite common. One should notice here as well that clinodactyly is not considered as a (severe) hand anomaly. NOTICE: In Down syndrome very short fingernails are often seen, sometimes the complete fingernail is very small (micronychia). Other typical characteristics of the fingernail in Down's syndrome are: no lunula - also in the thumb nail! NOTICE: The ulnar loops in Down syndrome tend to be vertically oriented and L-shaped - with the 'open' side directed to the side of the pinky finger. Another common variant is: 9 (or 8) ulnar loops combined with a radial loop on the ring finger or pinky finger. NOTICE: In Down syndrome the radial loop is most frequently seen on the ring finger (the radial loops are usually vertically oriented and L shaped - with the 'open' side directed to the side of the thumb. A radial loop on the thumb, index finger or middle finger should be recognized as a 'contra-indication' towards Down syndrome. NOTICE: In Down syndrome the radial loop on 5th finger (pinkie) is more frequently seen than radial loops on the middle finger (in the general population the reverse is always observed). NOTICE: The 'palmar ridge line A' starts in the triradius below the pointer finger. In Down syndrome the path of the 'palmar ridge line A' ends often just above or close to the point where the 'upper transverse crease' (heart line) exits the palm. In the normal population the path of the 'palmar ridge line A' is usually found completely below the 'upper transverse crease'. NOTICE: The 'palmar ridge line B' starts in the triradius below the middle finger. In Down syndrome the 'palmar ridge line B' ends usually in both hands at the edge of the palm between the pinky finger and the ring finger. While in the normal population more variation is observed. NOTICE: The 'palmar ridge line C' starts in the triradius below the ring finger. In Down syndrome the path of the 'palmar ridge line C' usually creates an 'interdigital loop', and exits the palm at a point between the ring finger and the middle finger. In the normal population this is a common pattern as well, but other variation are much more often seen. NOTICE: The 'palmar triradius C' concerns the palmar triradius that is usually positioned below the ring finger. In Down syndrome the c-triradius is often missing in the left hand, or the related 'palmar ridge line C' is ending without researching the border of the palm. This characteristic is far less often seen in the righ hand (in both Down patients and the normal population). NOTICE: The 'palmar ridge line D' starts in the triradius below the pinky finger. In Down syndrome the 'palmar ridge line D' occasionally ends at the thumb side of the palm (while in the normal population the 'palmar ridge line D' usually ends somewhere between the fingers). NOTICE: In Down syndrome the alignment of ridges over the distal palmar area is - partly due to the short, broad hand shape - nearly always rather 'transverse' (horizontal). This is usually indicated by the combination of a 'palmar ridge line A' which exits the palm above (or just below) the heart line, combined with a 'palmar ridge line D' which exits the palm between the pointer finger and the middle finger. NOTICE: It is important to notice that the atd angle is an age dependent characteristic (children have larger atd angles than adults). In Down syndrome adults a high displaced axial triradius (t") is often featured with a large AtD angle: 57o or higher. NOTICE: In Down syndrome the high displaced axial triradius (t") is often found in a position close to the center of the palm. Usually this high positioned triradius is featured with a pattern on the hypothenar [mount of moon] + another triradius (often postitioned near the wrist (t) or higher (t')). NOTICE: In Down syndrome quite often 3 or more triraii can be observed on the hypothenar [mount of moon] - due to the presence of various types of large loops, multiple loops, or whorls. NOTICE: In Down syndrome a large hypothenar whorl is relatively common. The hypothenar whorl is particularly significant when observed in both hands; or when observed in one hand but combined with a large hypothenar ulnar loop in the other hand. Double loops are very rarely seen in Down's syndrome, and are more common in the general population (where they are rare as well). NOTICE: In Down syndrome the large ulnar loops are by far the most common seen patterns on the hypothenar [mount of moon]; and especially when there is only 1 loop present on the hypothenar it is nearly always an ulnar loop. While in the general population hypothenar radial loops are much more common compared to hypothenar ulnar loops. NOTICE: Ridge dissociation concerns poor formation of the palmar ridges, resulting in skin ridge lines of which the direction is difficult to follow. In Down syndrome ridge dissociation is a very common characteristic that is often found in large parts of the palms (sometimes the full palm). NOTICE: In Down syndrome there are usually no loops or whorl observed on the thenar [mount of venus]; in the normal population those patterns are more common. NOTICE: Other studies 2 have indicated that the simian is also very significant when present only in the right hand; when present only in the left hand it is especially significant when combined with a Sydney line in the right hand. 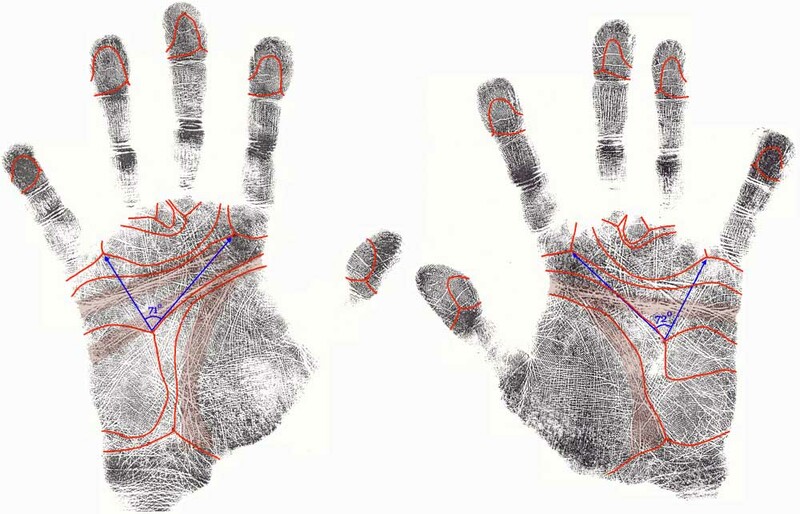 NOTICE: Other studies 2 have indicated that the Sydney line (= extended 'head line') is also very signficant if present in only one hand when combined with a simian crease in the other hand - especially when the Sydney line is present in the left hand. 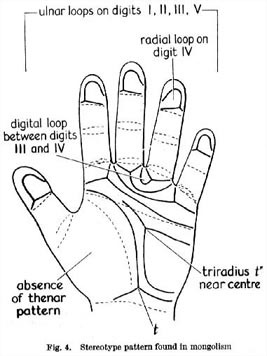 NOTICE: A study 2 has indicated that the extend distal transverse crease (= extended 'heart line') is signficant when observed in the left hand; in the right hand it is significant when combined with a simian crease in the left hand. NOTICE: Other studies from 7 different countries4 reported percentages in Down samples varying from 8.6 % to 37.7%.